Be frugal' is a call to action that resonates with most people these days. Making your dollar stretch further and coping with the dilemma of being time-poor create an urgent need for simple solutions to homemaking in all its aspects. Most importantly, these solutions must be affordable, attractive and achievable. The Budget + series comes to the rescue. Including cooking, gardening, craft and home maintenance titles, each book in the series is designed to help you make the most of your dollar and your time. The first cookery titles in the series are: Fridge Freezer Pantry, featuring 50 kitchen staples with three recipes for each one. 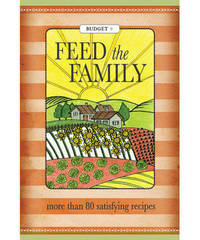 Feed the Family. More than 80 cheap and cheerful, satisfying recipes for the busy cook. The most basic of ingredients have, for centuries, been used to make flavoursome and nutritious low-cost meals. Something as simple as potatoes or tomatoes, for example, appear in cuisines all around the world in an astonishing array of dishes.